Captain Lenny Leonard and the Bone Fishing are one of the best fishing charters in Key West. While, charters and Captains are in no small supply in Key West, good Captains are hard to come by. However, Captain Lenny Leonard is the cream of the crop. Captain Lenny knows the Key West fishing waters like the back of his hand. In fact, he's been fishing these waters since he was a child. If you are looking for a well organized, fun, and enjoyable fishing charter in the flats than this is just the tour for you! Imagine fishing the shallows and all around the Key West flats. You might be fishing in the Marquesas or perhaps you want to give the Lower Florida Keys a try. Have you ever thought about battling ocean predators or fly fishing to land a boatload of Florida's best fish? If you want all this and more then you will not want to miss this charter. 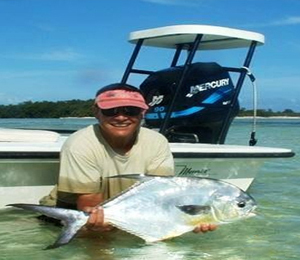 The bonefish fishing options are endless whether you are a beginner or seasoned angler. Captain Lenny will provide service and training with a smile. The Captain is well aware that some people will need more help than others. No matter how much help you need you will be given both help and advice with a smiling face and a knowledgeable response to all of your fishing questions. Fishing and fly fishing instruction will be given to ensure you are comfortable behind the rod that Lenny provides for you. Additionally, the customized flats skiff on the Bone Fishing is suitable for anglers of various skill levels. Beginners will appreciate the stability while experienced anglers will be incredibly pleased with the work that was done to create a perfect fishing environment. Captain Lenny's charters provide nearly everything you need for a successful fishing trip. Lenny is a fully insured and licensed captain. He recommends you bring a few different items to ensure that your fishing excursion is perfect. I have been to the Bahamas many times, but Bonefish Charters is one of my favorite trips! It includes everything that everyone should do here. As a Bahamas veteran, I can say only the best about this experience!